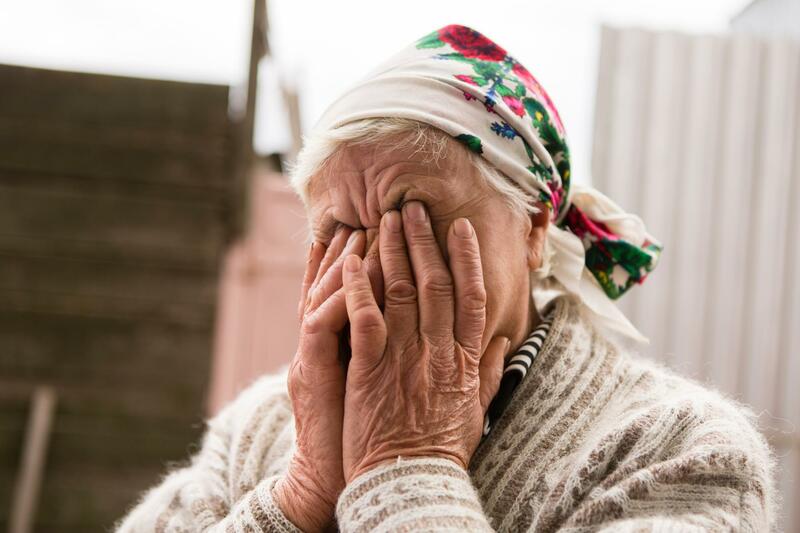 Ukraine: "This conflict has torn families apart"
Taisiya struggles to remember exactly when her house was first damaged by shelling - but she does remember being very scared. "Two shells hit the road, just in front of the main entrance," says the 82-year-old widow and great-grandmother of eight. "Shrapnel damaged the walls and some windows. "[My house] was shelled a second time this winter. I was alone, and it was very dark outside. "The roof was shelled twice, destroyed together with some of the rooms. All the windows broke apart. "It was unthinkable for me to stay alone here - it was too dangerous." Like many people who live in east Ukraine, Taisiya has had to live in constant fear of near-daily attacks around her village. After almost three years of conflict, civilians are still bearing the brunt of the ongoing violence, with more than 1.7 million forced from their homes. These experiences have left people with significant psychological trauma, affected by fear of shelling, isolation, and the deaths of loved ones. "These are people who've been left behind in their villages near the frontline, living with the fear of shelling and cut off from basic services, including healthcare. When your children have fled and you suddenly become unemployed, your entire universe falls apart." Our teams are providing mental health services to people trapped in these remote areas, travelling via mobile clinic to several locations around Mariupol and Kurakhove (east Ukraine). "The conflict in Ukraine is breaking communities and families apart," says Elena Pylaeva, a Médecins Sans Frontières/Doctors Without Borders (MSF) psychologist. "The majority of our patients are elderly women, often widows whose children and grandchildren have fled to find a safer place to live or work. "These are people who've been left behind in their villages near the frontline, living with the fear of shelling and cut off from basic services, including healthcare. "When your children have fled and you suddenly become unemployed, your entire universe falls apart. "Our goal is to provide the participants with emotional coping mechanisms which will have a positive effect on their physical health and emotional wellbeing." Valentina Viktorovna is a 52-year-old teacher who has seen her life torn apart by the ongoing conflict in eastern Ukraine. She lives in Pavlopil with her husband, a village located only few kilometers away from the contact line. Valentina Viktorovna receives medical care and mental health support from MSF through our mobile clinic in Pavlopil. After losing her job, her house was repeatedly damaged by shelling. She is now trying to put her life back together, helping others and hoping for the violence to cease. Valentina and her husband are receiving medical care from MSF. In addition, Valentina has also attended mental health counselling in order to cope with the stressful environment she had to live in for the past two-and-a-half years. “All my memories are in this village. It is here that I have built myself a life and raised our two sons with my husband. It used to be such a beautiful place; people would come here to spend summer time alongside the river. There was even a plan to build a tourist resort. I used to be a teacher in the village primary school. I loved my job. I kept all the drawings and pictures from my pupils. I was forced to retire when they closed the school. It became too dangerous for the children to stay as shelling was happening close by. So now, at only 52, I am already retired. I can’t get used to it, to this slow rhythm. If I had to compare it to something I would say I was like a high speed train that has been brutally stopped. So now I keep myself busy with volunteer work here and there, go and meet the other families from the village and see how I can be helpful. This is how I find meaning in this new daily routine: assisting others. There has been so much shelling near the house, so it is very damaged. It looks like it is going to fall on us. I can still remember the first time - the noise - and how everything was trembling around us. I was so afraid, picturing ourselves rushing out of a completely destroyed house. Luckily enough, the house is still standing, but it will take us time to fix it as we can’t afford to pay for the repairs. This conflict has torn families apart. Many left the village and some others left the country, like my eldest son. Even the ones who stayed in the region are afraid to come and visit because, even if it is more quiet now, the situation is still unstable. I don’t get to see my sons and grandchildren often so I keep their pictures and drawings on this wall to have the feeling they are here with us. I miss them so much. We were just left with nothing. Fortunately we received support from organisations. I hope that this violence will come to an end soon so we will be able to go back to our lives. Since March 2015, we have been running mobile clinics in locations around Mariupol and Kurakhove in Ukraine. Our mobile teams, usually composed of a doctor, nurse and a psychologist, ensure there are medical consultations, donations of medicines and mental health support to displaced people as well as to the people living along the contact line. We also support health facilities with donations of medical supplies. As of the beginning of January 2017, our teams have carried out more than 36,800 medical consultations, as well as 5,980 individual and group mental health consultations around Mariupol and Kurakhove. Some 17,200 patients also attended from mental health awareness presentations in the mobile clinics. Anxiety-related disorders continue to be the main issue among patients receiving mental health support, followed by depression.